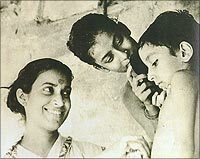 To his uninformed detractors -- including the late Indian actress Nargis Dutt -- filmmaker Satyajit Ray was a tireless chronicler of Indian poverty whose Pather Panchali captured the attention of serious filmgoers across the world. Much before the populist and sensational Slumdog Millionaire became an unprecedented award-winning hit, one might add. But to Ray's admirers, he was one of the most versatile filmmakers who tackled themes dear to the middle class, made films for young adults and children -- including in the mystery genre -- and questioned fundamentalism of all hues. His admirers include movie moguls like Steven Spielberg, iconoclastic directors like Akira Kurosawa and a number of Indian filmmakers including Mrinal Sen, Mira Nair and Buddhadeb Dasgupta. April 15 to 30, New Yorkers and film buffs in the tristate area have a unique opportunity to study the phenomenal filmmaker. The Film Society of Lincoln Center will be hosting First Light: Satyajit Ray From the Apu Trilogy to the Calcutta Trilogy, a retrospective of the director's early work. The series, which has over 18 films, is also a tribute to the work of the Satyajit Ray Preservation Project at the Academy Film Archive in Los Angeles, which together with the Satyajit Ray Film and Study Center at the University of California-Santa Cruz has done so much to preserve and promote the work of this major film artist for future generations, said Richard Penya, director, The Film Society of Lincoln Center. There are plans to offer a second series that will include the rest of Ray's films. The Lincoln Center festival offers at least six films in new prints from the Academy Film Archive. These include Goopy Gyne Bagha Byne (The Adventures of Goopy and Bagha), Jalsaghar (The Music Room), Kapurush Mahapurush (The Coward and the Holy Man), and Nayak (The Hero). Many films in the retrospective will surprise those who have seen just one or two of Ray's masterpieces. Some of these films, say for example Chiriyakhana (The Zoo, a whodunit), may not be as appealing as some of Ray's best work including the Apu trilogy, but nevertheless they are superior to most films made around that time in India. Though he worked outside the mainstream, Ray did not see any of his films losing money. 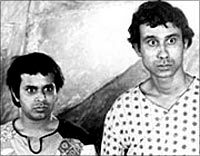 While some of his films like Pather Panchali made most of their business in Europe and America, a few of his films like Goopy Gyne Bagha Byne, which were hardly shown abroad, became resounding successes in Bengal. 'I find I am inimical to the idea of making two similar films in succession,' Ray had said after making over a dozen films, a tribute to him in The New York Times revealed. In conjunction with the series, Columbia University will hold an April 25 conference on the filmmaker featuring professors of film and literature from universities in the United States and India, including a keynote lecture from Robert Young of New York University and talks by Samik Banerjee, vice chairman, National School of Drama, India. The Columbia conference will also feature talks by filmmakers Mira Nair -- who says Ray and Ritwik Ghatak are the reasons she became a filmmaker -- Shyam Benegal -- who while being an ad executive dreamt of making films thanks to Ray's inspiration -- and Ray's son Sandip Ray. Why is Satyajit Ray admired so much? Satyajit Ray (1921-1992) made a movie every year from 1956 to 1981 and received an honorary Oscar for lifetime achievement in 1992. In a country where hardly a filmmaker in the mainstream has made more than 10 successful films, Ray made 36 films and half a dozen documentaries that either broke even or turned in a profit. His first Hindi-language film Shantranj Ke Khilari (not part of this festival) featuring Sanjeev Kumar, Shabana Azmi and Amjad Khan ran for about six weeks in Mumbai and a few other Indian cities. But the film, called The Chess Players for the international audience, ran for more than 10 weeks in London and New York, and over two weeks in at least 12 European, Canadian and Japanese cities, leading it into profit. Ray -- who switched to films from working in an advertising agency after meeting French filmmaker Jean Renoir and watching Vittoria De Sica's The Bicycle Thief was -- a complete filmmaker. Ray was a prolific and successful writer too. He created a much-loved private detective, Pradosh C Mitter or Feluda -- whose adventures practically every Bengali kid who can read knows by heart -- wrote science fiction stories starring the ingenious scientist Professor Shonku, and a huge bunch of short stories (bizarre, macabre, funny, touching, scary, science fiction -- you name it he wrote it). Ray, part of an illustrious family of Bengali writers and artists, would also sketch for his stories. The drawings were so much a part of the stories that the people he cast as the characters in the two Feluda films he made were mirror images of his drawings.